I don’t really believe in setting New Year’s resolutions. Not only are the gyms incredibly packed in January (I hardly have time for exercise as it is – I certainly don’t have time to wait for my turn on a treadmill) but I know I can be a procrastinator. If I set myself a goal like “starting January 2nd, I’m going to start exercising daily and eating healthier” I know that by January 15th I’ll still be putting it off until the “perfect” day to start my new healthy lifestyle. Don’t believe me? Let’s just say my son is two weeks away from his 6th birthday and only last year did I stop referring to my extra pounds as “baby weight”. I’m still hanging onto the “mommy brain” excuse for my bad memory though. I’m pretty sure mommas can hold onto that one until their kids move out of the house. In early 2016, I finally decided to stop making excuses and just start a healthier lifestyle now. No more waiting until after a special event coming up or after my next vacation. If I was going to make a change, today was going to be the day. That was well over a year ago now and I’m proud to say that I’ve kept it up. I exercise daily, I eat healthy meals and I try to keep my stress levels down. I’ve dieted in the past but that has never worked for me. If I was going to start a healthy lifestyle I knew it had to be a permanent lifestyle change and not a quick diet. Completely banning certain foods from my life isn’t something that would work for me. I still love sweet treats and I’ll never give up my weekly nacho night with friends. Can you still indulge that sweet tooth but live a healthier lifestyle? Absolutely! It’s all about moderation and Lantic-Rogers wants to help with their new more natural sweeteners. 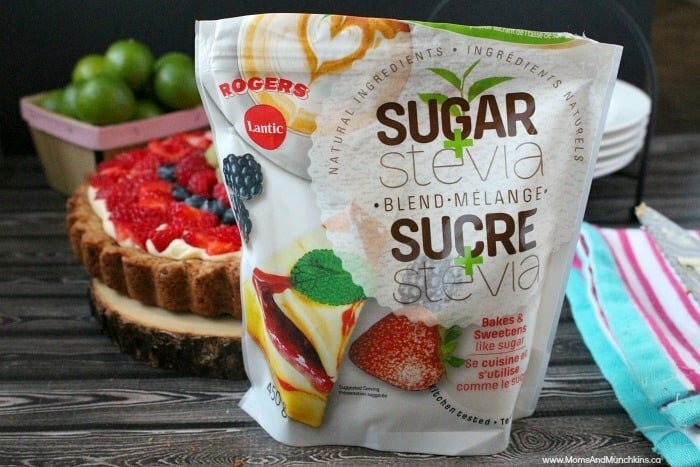 The Lantic-Rogers Smart Sweetener Blend Sugar + Stevia uses all natural ingredients with no fillers, artificial sweeteners, preservatives or chemicals. How does it compare to regular sugar? For every cup of sugar in recipes, simply replace with ½ cup of Sugar + Stevia Blend. This means you could be enjoying up to 50% less calories than sugar. 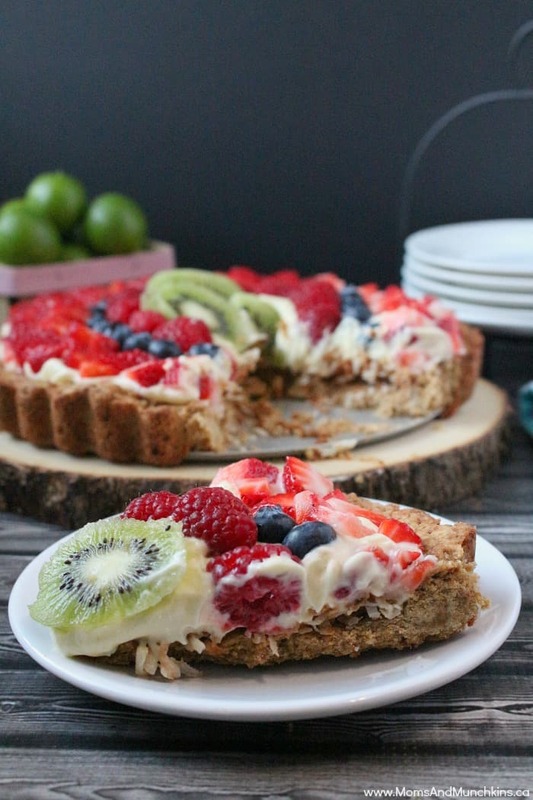 As for the taste – I really couldn’t taste a difference in the Key Lime Coconut Fruit Tart (recipe included below) I made. It tastes just as delicious as sugar but without the guilt of the added calories. 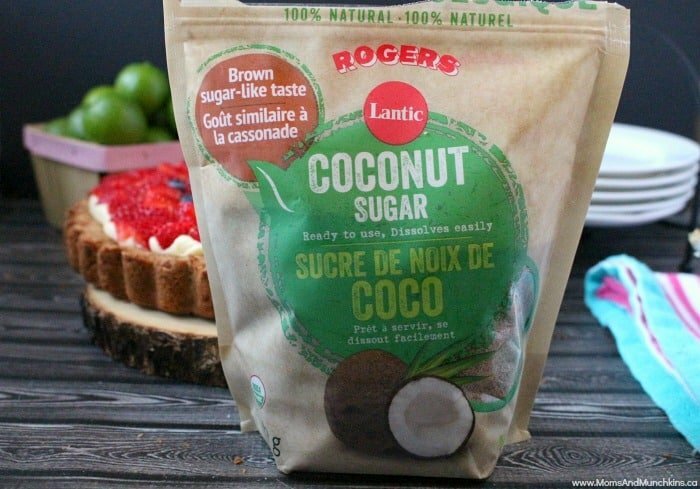 The other Lantic-Rogers product you’ll want to look for at the store is the Organic Coconut Sugar. It was voted the winner in the sugar category for Product of the Year (Canada Consumer Survey of Product Innovation 2017). Now you know you have to try it for yourself, right? It is 100% natural and does not contain any artificial flavours or preservatives and is not chemically altered in any way. It has a brown sugar-like taste and it was delicious in the crust for my Key Lime Coconut Fruit Tart. These new nature inspired sweeteners are available in Loblaws stores now. Don’t miss this $1 off coupon on Save.ca. You can find delicious recipe ideas on the Lantic-Rogers website. I have a serious sweet tooth but I try not to indulge too much. 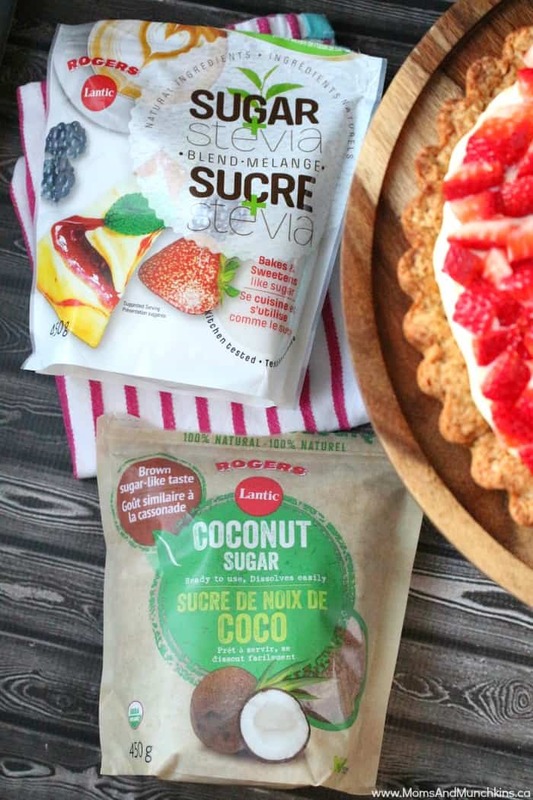 These new more natural sweeteners helped me create this delicious Key Lime Coconut Fruit Tart that is perfect for the spring & summer party season. 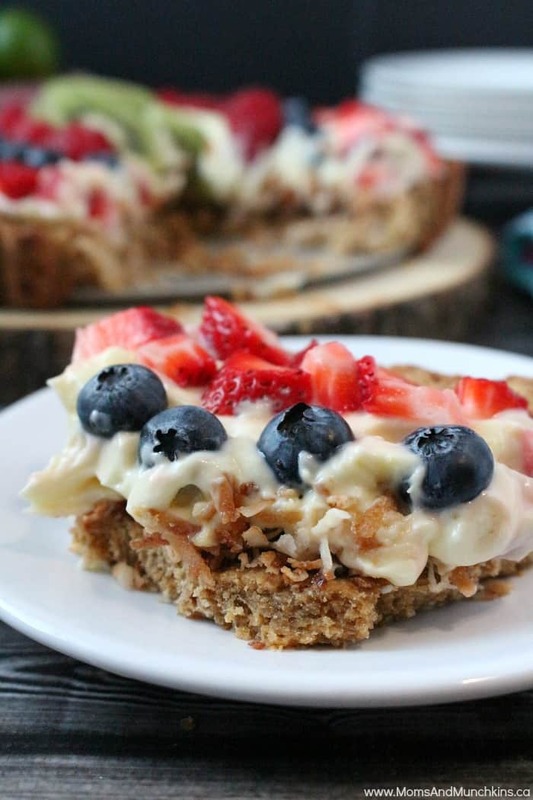 There are a few steps in this recipe but trust me when I say it's still easy to make! In a medium bowl, whisk the flour, sugar, and salt. Using a pastry cutter, cut the butter into the flour mixture. The mixture should resemble a crumbled topping. Pour the wet ingredients into the flour mixture and stir to combine. Use your hands to form the mixture into dough. Press the dough into a greased 9-inch tart pan. Press it down into the pan and up the sides until it is even all around. Put the crust in the freezer for one hour. This helps it to hold its shape when baking. Remove crust from freezer then use a fork to poke a few holes into the bottom before baking. Bake the crust for 20 minutes or until it is a golden brown colour. Allow to cool completely before filling. Place the eggs, Sugar + Stevia, salt, key lime juice and zest in a medium saucepan. Place the saucepan over low heat. Stir constantly with a wooden spoon until the mixture thickens (this takes about 5-7 minutes). Add butter and stir until butter is melted and key lime curd is smooth. Remove from heat and strain mixture to remove any lumps. Place key lime curd in refrigerator until completely cooled. Add cooled key lime curd to the cream cheese and beat just until blended. In the bottom of the cooled tart shell, sprinkle toasted coconut evenly. Top that with the key lime curd mixture. 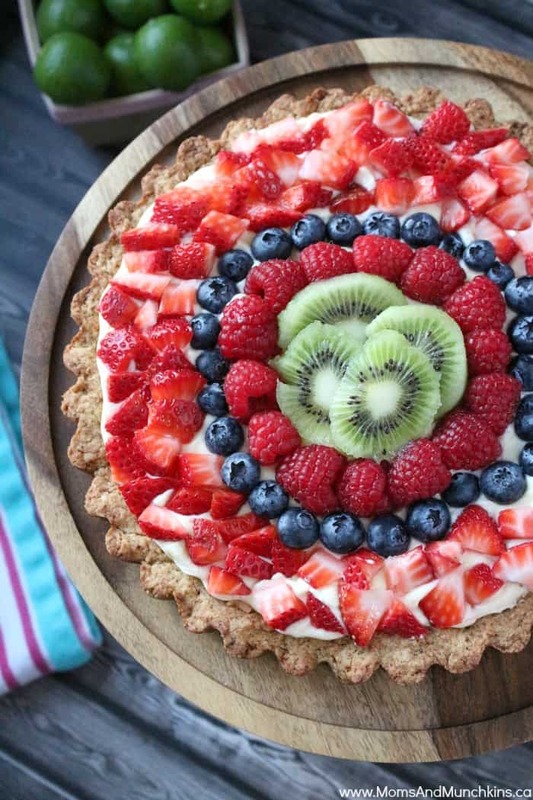 Add berries and fruit to the top of the tart. Refrigerate until ready to serve. Don’t forget the $1 off coupon on Save.ca. These new nature inspired sweeteners are available in Loblaws stores now. *Disclosure: I was compensated for this post; however, all opinions expressed here are my own. Thank you to FeedFeed for featuring this recipe in their Best Coconut Recipes list. Oh my goodness, this looks amazing. 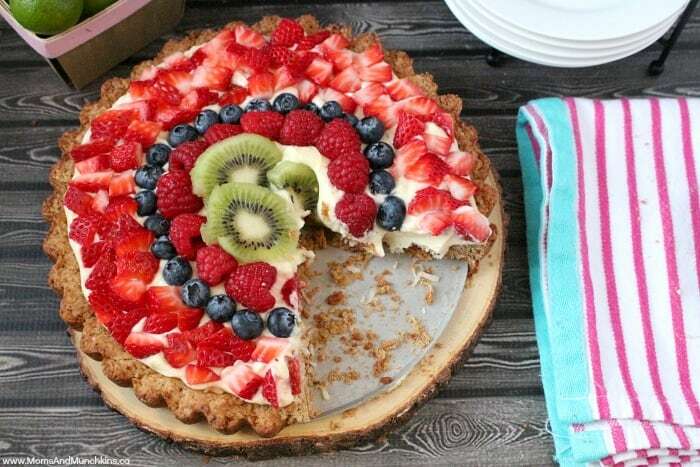 This would be a perfect Mother’s Day desert.